The energy treasure hunt at the grocery store is almost too easy. The bright lights, cooling or refrigeration of a large stock of items year-round, heating in the winter and air conditioning in the summer, the places we go to buy our food use a lot of energy to keep us in groceries. Energy may not be as big of a cost for retail stores compared to industrial businesses and the ability to find energy treasures that can easily turn into savings might be more difficult. Today I found an extremely easy one. 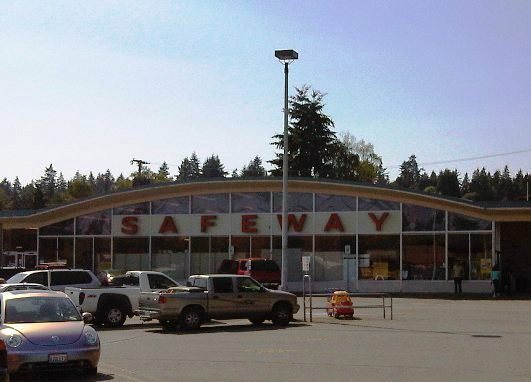 Pay attention, Safeway executives. It was a beautiful day in the Pacific Northwest, the waning days of summer squeezing out their last rays of sun before making way for the clouds and rain which will cover us for the next 8 months. 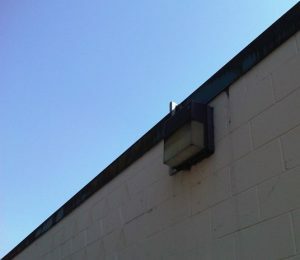 Even against this bright blue sky, the square light fixture stood out like a beacon. Positioned at the rear of the building, it’s out of sight and not noticeable unless you are on a casual weekend energy treasure hunt. 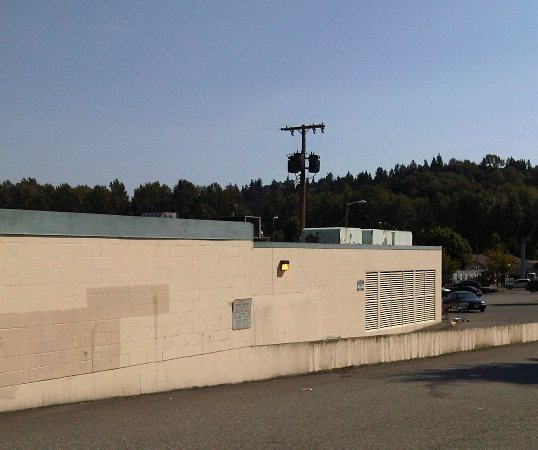 No doubt the switch for this light is hidden behind a rack of old supplies near the door to access the dumpster and the light remains on 24×7 with nobody paying it any mind. Here is the same type of light on the pedestrian street side of the grocery store. That’s how the light should look at 2:50 PM, regardless of weather. 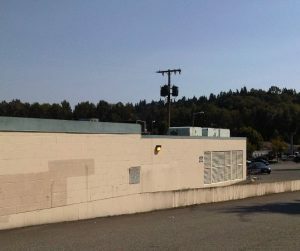 A simple act of making a standard to switch off outside lights during the day, training everyone to follow the standard, and then having store supervisors check regularly that these standards are followed would no doubt save millions across Safeway’s 1,700+ retail outlets in North America. For an industry that is known for thin profit margins it would seem this would be an easy switch to make, if you will excuse the pun. How about retrofitting the interior with light tubes like those from Solatube? While this is capital expense for existing stores, it’d be worth a look for new stores. You could shut off the interior lights for most of the day and enhance the shopper’s experience with natural light. Important Lessons in Kaizen from A Different Kind of Map	Bad News from MIT for the PDCA Cycle?